Get more craft room design tips! If you have a pile of craft supplies, some extra space in your home, and some basic knowledge of how to design a craft room, you'll be well on your way to a space to let your creativity out to play. Whether you are creating this room in a new home or are renovating an existing bedroom, having your own craft room will give you the space to spread out. Do you pick up after yourself or is your current craft space a jumble of half-finished projects? Do you focus on one or two crafts or have supplies for a multitude of activities? How often do you use your craft supplies? Are there some supplies you use more often than others? After you've analyzed your crafting habits, it's time to start designing. As you work out the ideal layout and design of your craft room, pay special attention to storage and organization of supplies, as well as work surfaces and zones. It's one thing to get your craft space organized, but it's another to keep it that way. Whether or not you typically pick up after yourself, you can help keep your craft room tidy by having a place for everything. Take an inventory of all your crafting supplies, and then sort them by craft, size, and frequency of use. Purchase containers to accommodate what you have. If you quilt, organize your fat quarters and other quilting fabric by color. Then, invest in a few clear plastic containers. Place all the green fabric in one container and all the pink fabric in another one. If you enjoy making soap, try putting all of your soap molds in one plastic container and all of your tools in a drawer or tub. Use smaller containers for your scents, dyes, and other additives. Scrapbookers can sort papers by color and then file them in a filing cabinet or scrapbooking organizer. Embellishments can go in another container, and tools, pens, and scissors can go in a handy desktop organizer. Ideally, your craft room will also have a place for you to spread out and really get involved in a project. The best crafting surfaces are durable and easy to clean. You can use a piece of laminate countertop or even an old table. If you do a lot of sewing, you may need a specially-designed table for your sewing machine. Pay special attention to lighting. You'll need good, bright lights for detail work, and you'll also want to see your projects in natural light if possible. A room with a large window is ideal. You also may want to consider adding a sink to your plans. Many crafts require the use of glue or paint, and it's handy to have a utility sink nearby for easy clean-up. Alternatively, you could situate your craft room near a bathroom, kitchen, or laundry room. Decorate the room in a way that makes you happy, rather than trying to coordinate with the rest of your house. Use colors and accessories that make you feel cheerful and increase your creativity. If there's space, set up a kid-sized craft area for the little ones. This will help keep them occupied while you are working on a project. It also sets a great model for valuing artistic pursuits. 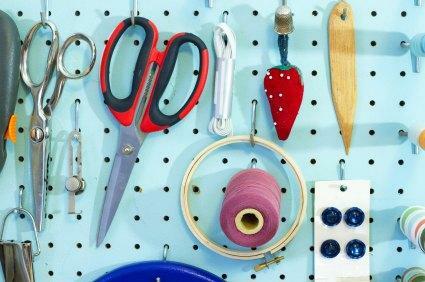 Use empty wall space to create a pegboard organizer. You can paint it an attractive color and keep tools and supplies within view. What if You Don't Have a Room? Take over a closet. Use inexpensive closet organizers and shelving to create a craft storage area in your guest room or family room. You can stack clear plastic containers on shelves, making it easy to access your supplies when you need them. If you don't have a close to spare, convert an old china cabinet or armoire to a craft storage center. You can buy a second-hand china cabinet and give it a new coat of paint. Then, simply stack your supplies on the shelves. You can use drawers for tools like knitting needles, scissors, and tape measures. Create a craft area in your laundry room or kitchen. Use extra cabinet space to store your supplies. This is a handy option if you need to have a sink nearby for many of your craft projects. Having a place to craft makes it easier to be creative. You no longer have to hunt for supplies or make emergency trips to the craft store for things you know you already own. Now that you know how to design a craft room, you may find that you're more creative than ever.